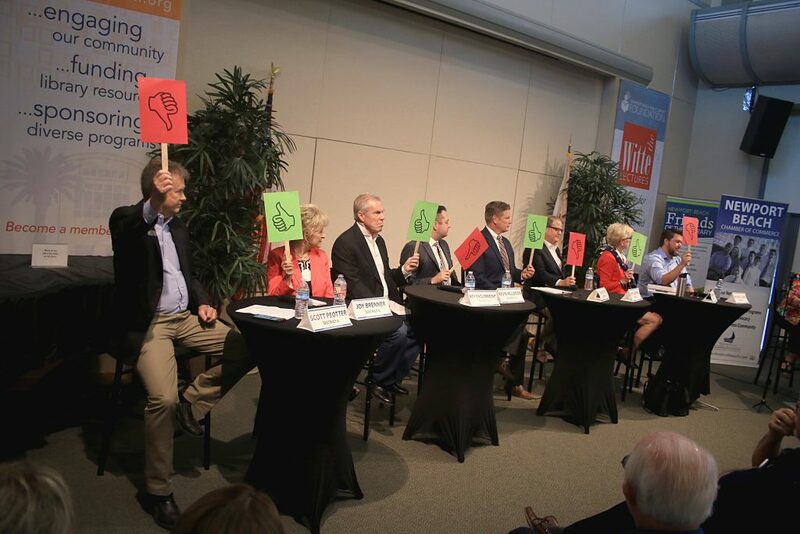 The 2018 Newport Beach City Council candidates (left to right) Scott Peotter, Joy Brenner, Roy Englebrecht, Kevin Muldoon, Tim Stoaks, Marshall “Duffy” Duffield, Diane Dixon and Mike Glenn, answer a question about if the city should have a role in funding public art during the first forum of the campaign season, hosted by the NB Chamber of Commerce, on Thursday. The first Newport Beach City Council candidate forum of the year featured a range of topics, both agreement and disagreement between candidates, and a few jokes and jabs. About 100 people attended the Newport Beach Chamber of Commerce hosted a forum to “Meet the Candidates” on Thursday. Orange County Business Council CEO Lucy Dunn moderated the event. The 2018 candidates attended (incumbents listed first): Diane Dixon and Mike Glenn, running for District 1; Marshall “Duffy” Duffield and Tim Stoaks, in District 3; Kevin Muldoon and Roy Englebrecht, in District 4; and Scott Peotter and Joy Brenner, in District 6. District 1 covers Balboa Peninsula and West Newport; District 3 includes area around Castaways, Dover Shores, and up the bay to Santa Ana Heights; District 4 covers Eastbluff, One Ford Road, Bonita Canyon, and Baypointe; and District 6 includes Corona del Mar, Cameo Shores, and Pelican Hill. The forum included one-minute introductions, a lightning round of a series of support/oppose (or thumbs up/thumbs down) questions, several quick answers on hot topics, and concluding remarks. A lot of the comments from the challengers focused on the need to change the current direction of Council. “I love this city, but I think it’s going in the wrong direction,” Stoaks said. Brenner echoed the sentiment that the current trend is not what residents want. Englebrecht said some of the current council wants to urbanize the city. The “soul” of the city refers to local businesses, the small, local events, the charm of the community, and the residents, he explained. Glenn kicked off his introduction by criticizing Dixon, noting that she ran unopposed four years ago, which is what compelled him to run this year. “These are the type of things that we cannot have in the city,” Glenn said. The incumbents focused on what they’ve accomplished the past four years. Peotter noted the Council’s work on paying down the unfunded pension, the audit of the civic center project, and their action to oppose SB 54, the “sanctuary state” bill. What they didn’t do, which he said is almost just as important, is create the city hall and Marina Park debt, among other things. Dixon said she’s running on her record, which she stands by. The city has had a balanced budget with a surplus each year, while aggressively paying down the unfunded pension. They have worked to keep the community safe and maintain a high quality of life, she added. “I would be grateful to serve another four years,” Dixon said. It’s about listening to residents and business owners, while also making a pledge to “do the right thing,” Dixon said. It’s important to treat people with respect, she added. Muldoon said he loved serving the city and he wants to continue working with residents on a number of issues, including public safety and unfunded pension liability. Duffield said he approaches his Council work with the perspective of a businessman, thinking how the city can do things cheaper, better, and faster. He focused on the harbor, noting how much it does for the economy of the entire city. A noteworthy question during the forum centered around Measure T, the measure placed before the Newport Beach electorate in November that will ask if voters would like to amend the City Charter with language that would require 55 percent voter approval prior to issuing lease-revenue bonds, like Certificates Of Participation, greater than $50 million to finance capital projects. Duffield, Muldoon, and Peotter are authors of the argument in favor of the measure, and all three expressed support of it again on Thursday. As in their official argument, they again cited the COPs used to finance the civic center. Dixon said she supports the measure and noted that she said in 2014 that there should have been an advisory vote on the civic center project. It’s taxpayer money, Muldoon said. The voters deserve a say regarding long term debt, he added. Although there was some criticism from the challengers about the how the measure came about. 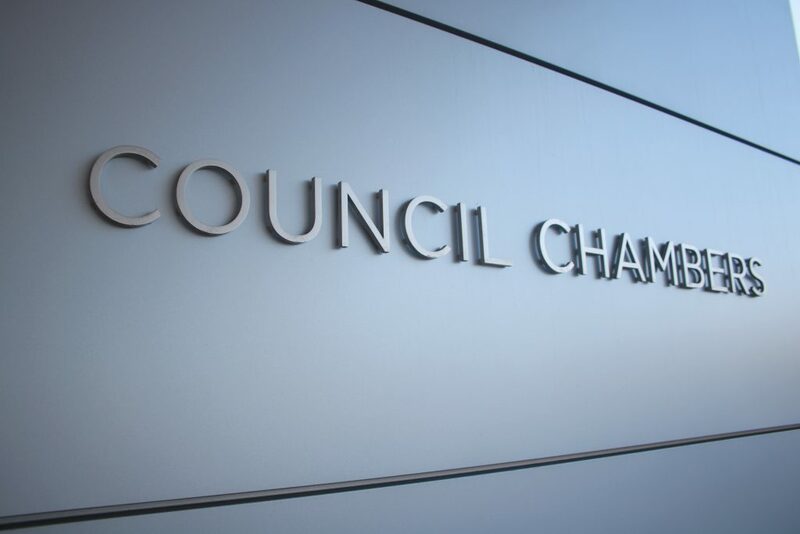 “I just think ‘T’ was a way for this City Council, and going into the election, to make themselves look good and a way for them to fund a campaign,” Englebrecht said. Brenner added that certain Council members are “playing politics” with this issue. It’s ironic that they’ve ignored what the public wants in the past, citing the Museum House condo project, the handling of City Manager Dave Kiff’s retirement, and the proposed Port Plan for Newport Harbor. she said. It might be a good idea, but it should have gone through the Finance Committee and through a proper review, Brenner added. “There should have been a lot of homework done before this was put on the ballot,” Brenner said. There hasn’t been enough conversation or debate, both internally in the Finance Committee and with residents, Stoaks agreed. Glenn said he supported the measure, but if the city doesn’t properly budget for these big projects, when they typically know the costs years in advance, that’s a problem. “We should not be borrowing money to get the city more in debt,” Glenn said. During the “lightning round” candidates held up a paddle with either the red “thumbs down” or green “thumbs up” to visually indicate their support or opposition to a question. All the candidates agreed on a few of the questions, including whether to make Mariners’ Mile three lanes (all opposed) and if they favored Proposition 10 about local rent control ordinances (again, all opposed). They were split to some varying degree on all other questions, including whether or not to eliminate or reduce the business license fee (Glenn, Muldoon, and Peotter supported the idea), if the city should have a role in funding public art (Dixon, Stoaks, Englebrecht, and Brenner supported the concept), and if they favored selling the land under the new Lido House Hotel on the Balboa Peninsula (all said no except from Glenn who supported the move and Englebrecht who waved his paddle as a “maybe”). Traffic on the Balboa Peninsula. In another round of questions and short answers, Dunn asked about traffic, which most agreed had to do with the visitors coming into Newport Beach. Several challengers agreed it had to do with overdevelopment. “It’s about developing big buildings where there are small roads,” Glenn said. It’s important to not infringe on property rights, he added. “I believe you ought to build what you want on the property that you own,” Glenn said. 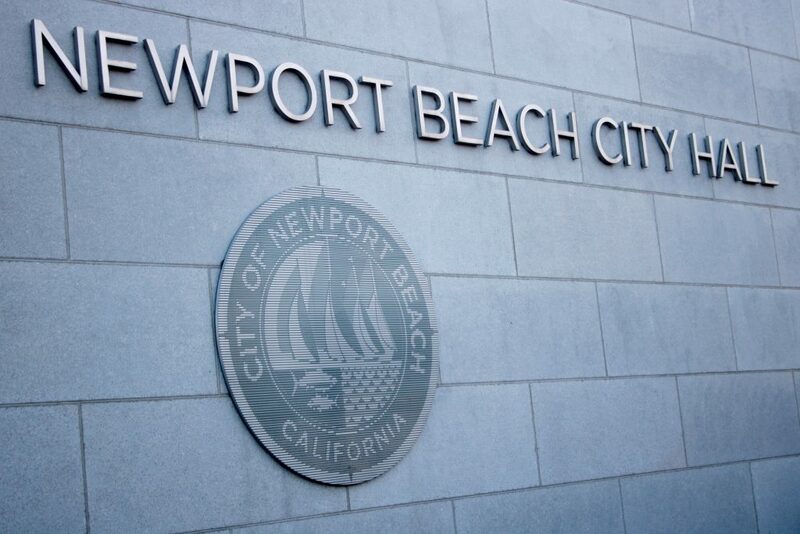 But there is a “charm” to Newport Beach that should be maintained, he added. Both Dixon and Muldoon noted the changing technology to help deal with traffic, specifically pointing out the city’s work to synchronize street lights. Duffield said a lot of the traffic are commuters going through the city, which peaks in the morning and afternoon rush hours. “Obviously we have traffic problem,” Peotter said, but it’s not due to overdevelopment in Newport Beach. But it’s not growth within the city, it’s growth in nearby Southern California cities and visitors coming into the city, Peotter said. 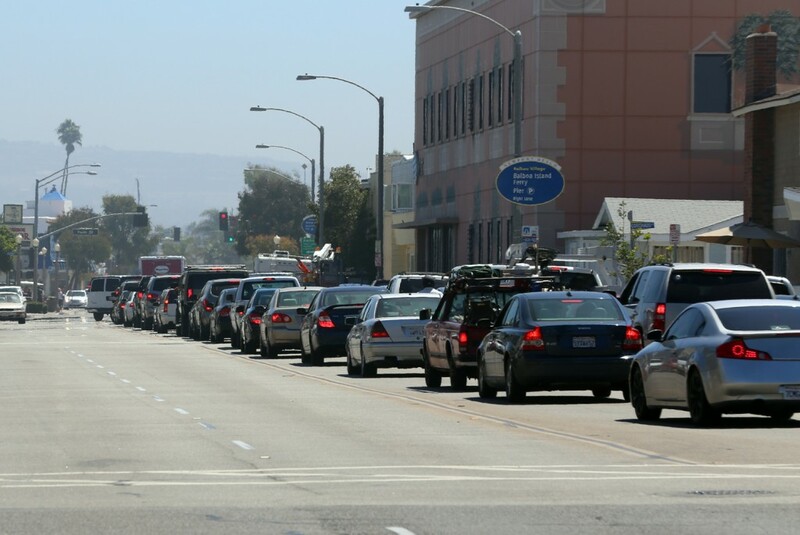 Others agreed that it’s the sheer number of people who come into Newport Beach, particularly during the summer, and that, while it’s an economic boost and there are several positive points that come from this, it does increase the number of cars on the road and contribute to congestion. “There are just too many people and not enough lanes,” Englebrecht said. It needs to be managed better to allow improved flow, he added. Traffic has been a problem for several decades, Brenner noted. Statistics can be manipulated, she added as an example, a high-rise development that shows that it lowers traffic, Brenner said. “We know that’s not true,” she said. Asked about the General Plan and development, all said they support the GP, but a few noted that it was outdated and needed to be reviewed. Stoaks said it’s about “balanced growth,” which a few candidates also mentioned during the forum. Dixon called it “managed” and “smart” growth if it conforms to the General Plan guidelines. Duffield added that the GP needs to be enforced better, noting several marine -related businesses that left the waterfront and were replaced with unrelated businesses. Englebrecht emphasized that development should not impact public views, which is part of what makes Newport Beach great. Dunn also asked about homelessness, which most candidates agreed that the city should work with the county and at the regional level. They also praised Newport Beach Police Department’s Officer Tony Yim’s work on the issue. Peotter and Glenn also mentioned that they would like to see the churches get more involved. Englebrecht suggested “foster” homes. Glenn noted that there are things the city can do to discourage them from coming into the city, and there are things that encourage them to come into the city, like the Balboa Peninsula Trolley, which he called a “mobile air conditioning device.” Stoaks noted that it’s not just providing housing, but also jobs, like cleaning up the beaches. As far as the legalization of marijuana and allowing marijuana products to be sold in the city, something the Council has already voted against, nearly all the candidates opposed the idea except for Glenn. Englebrecht said he was torn on the issue and wanted to hear more from residents, police, and the city attorney. Several candidates noted that there is access nearby. Glenn spoke about a friend with cancer who had to travel to a nearby city just to get his medical marijuana. There does not need to be “neon lights” and dispensaries on every corner, Glenn continued, but he sees no problem with a delivery to someone’s house in Newport Beach. On other topics, all the candidates emphasized the importance of paying down the unfunded pension (the big “elephant” in the city, Duffield said), agreed that maintaining the sea walls is a citywide issue (“We’re going to build a wall and make Catalina pay for it,” Muldoon joked), and that it’s critical to preserve the John Wayne Airport agreement (several also mentioned working directly with the airline carriers). 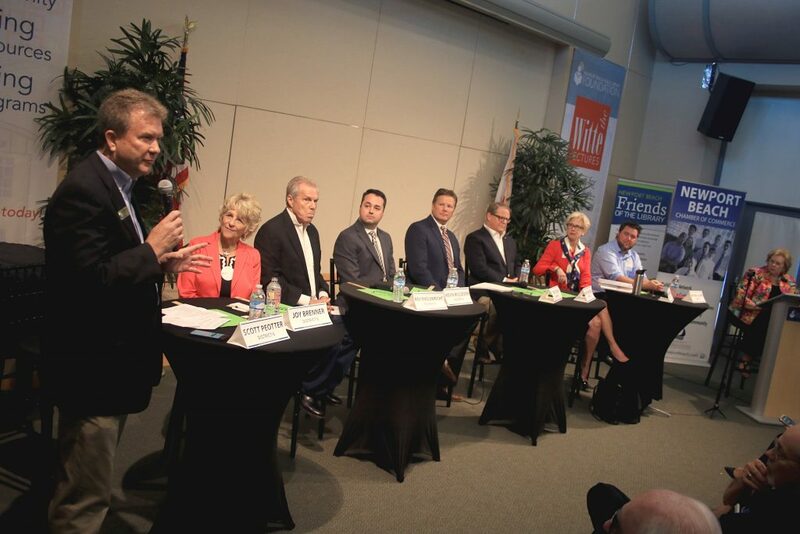 The 2018 Newport Beach City Council candidate Scott Peotter introduces himself as other candidates (left to right) Scott Peotter, Joy Brenner, Roy Englebrecht, Kevin Muldoon, Tim Stoaks, Marshall “Duffy” Duffield, Diane Dixon and Mike Glenn, listen during the first forum of the campaign season, hosted by the NB Chamber of Commerce, on Thursday.